If Alex and Ren are going to stop the Death Walkers, they know they have to find the powerful Lost Spells. So they head to the Valley of the Kings, deep in the Egyptian desert -- where they discover that Egypt is in the grips of madness. Voices in the air whisper dark secrets and flashes of light burn across the night sky. Michael Northrop is the acclaimed author of books for young readers including Gentlemen, a Publishers Weekly Flying Start; Trapped, an Indie Next List Selection; and Plunked, a New York Public Library best book of the year and an NPR Backseat Book Club selection. 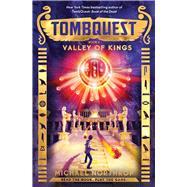 He is also the author of TombQuest, an epic book and game adventure series featuring the magic of ancient Egypt. An editor at Sports Illustrated Kids for many years, he now writes full-time from his home in New York City. You can visit him online at www.michaelnorthrop.net.